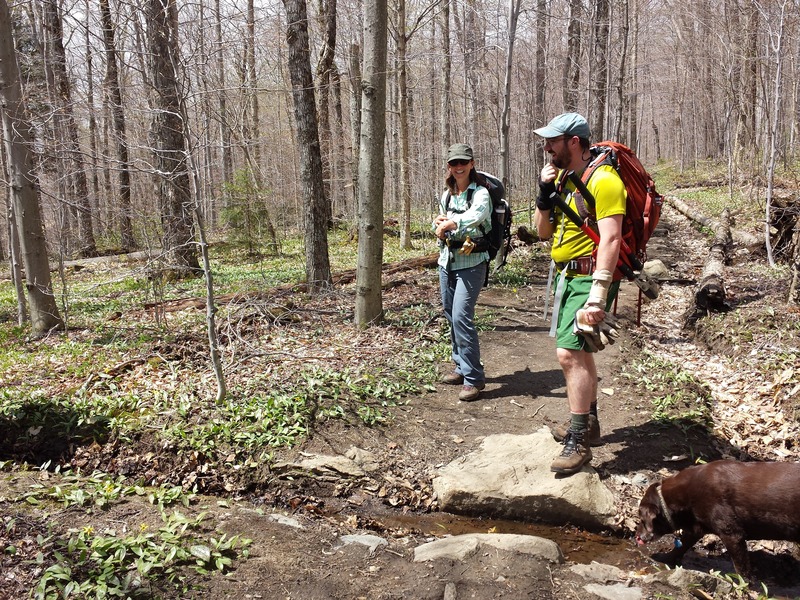 We met at 8:30 at the Cambridge park and ride and took two cars to the difficult-to-find Davis Neighborhood trailhead on Cross Road, just off the east part of Codding Hollow Road. The weather was very cool for July (in the high 50s F) and overcast, but dry, as we started off at around 9:10. We took Codding Hollow Road, passing crews doing culvert work and continuing over the undrivable middle portion of the road to the Long Trail crossing. 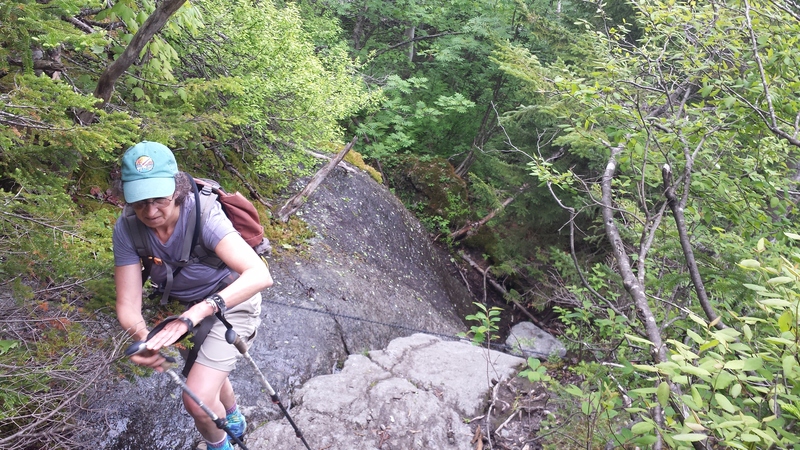 We headed up the Long Trail and along the base of the overhanging rock on the south side of Laraway and reached the Laraway lookout around 11:10. We were still under clouds, but could see patches of sun in the valleys below. We continued to the summit where we had lunch around 11:30 and the few of us still in short sleeve shirts donned long sleeve shirts or jackets. 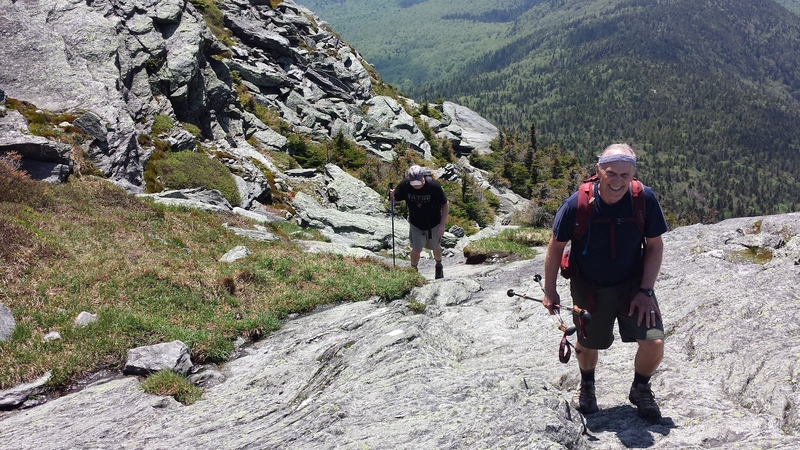 We then headed down the Long Trail, reaching Corliss camp around 1:15, where we met a couple guys out for an overnight. We continued down Davis Neighborhood Trail to reach the cars around 1:55, for a total hike time of about 4 hours and 45 minutes. Participants: Rich Larsen, Max Seaton, Jill George, Susan McDowell, Beth Ulzheimer, David Hathaway (leader). 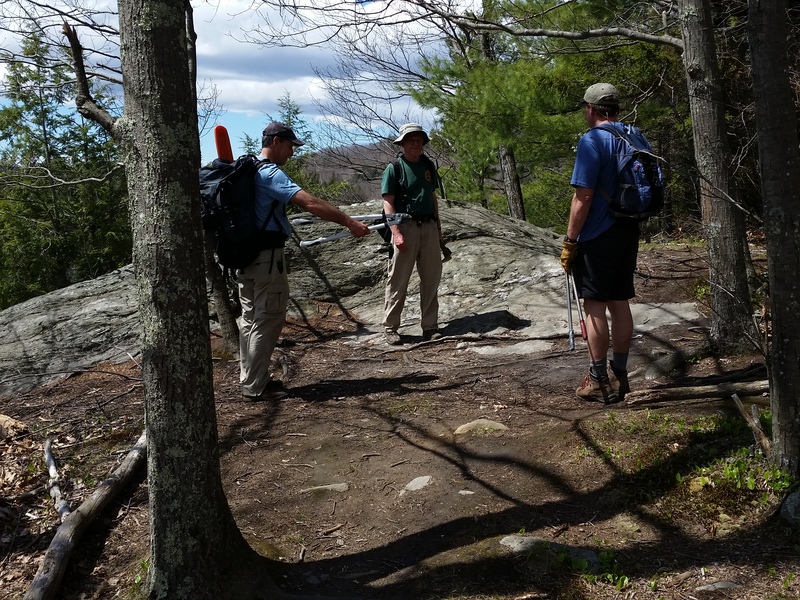 For our National Trails Day work hike, we had 6 regulars and one person from Maine. 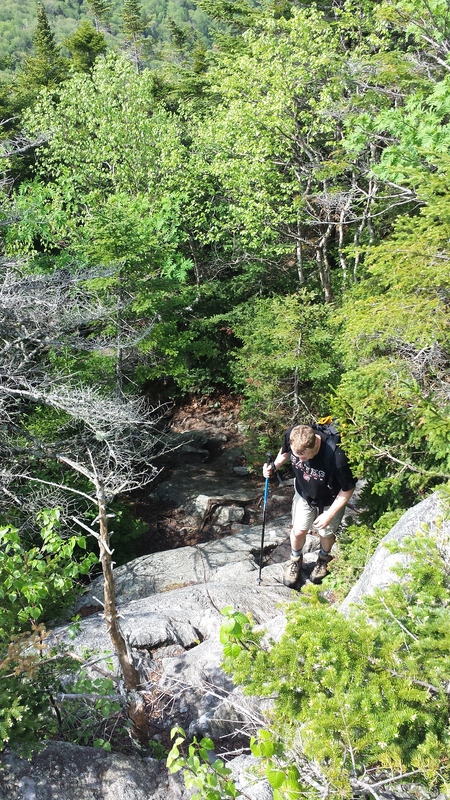 We went from Bolton Valley parking, using the cross-country trails to access the Long Trail. We split into 2 groups. 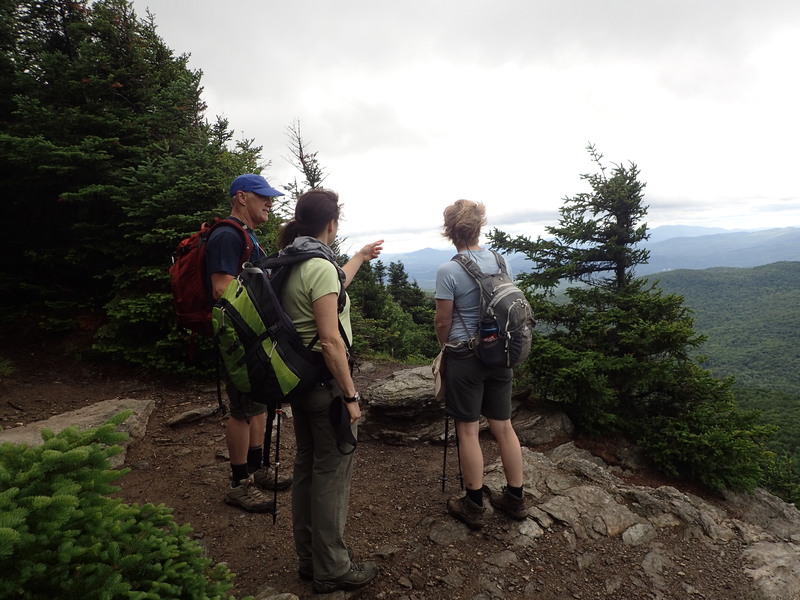 Three folks went up over Bolton Mt. to Puffer, clearing from Ravens Wind crossing to Puffer. They had only one tree to cut. The other 4 went up to the Eagles Nest LT junction, headed south, with John going down to Buchanan Lodge to cut the trees on that spur trail (where the chain saw had malfunctioned on the first outing). 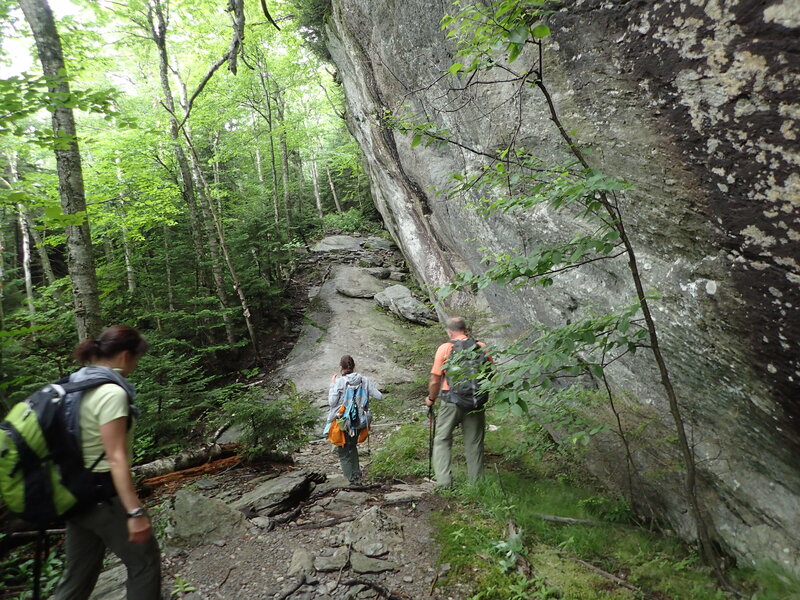 Then, after clearing Eagles Nest to Buchanan Spur, the group headed north and cleared to Ravens Wind. There were a couple trees to cut on the LT. The 2 groups met up at Ravens Wind and headed down. It was a pretty long day with a lot of hiking, but very good that we covered the whole section. Also, once again we lucked out with great Saturday weather (though could have been a little cooler) followed by a very rainy Sunday! 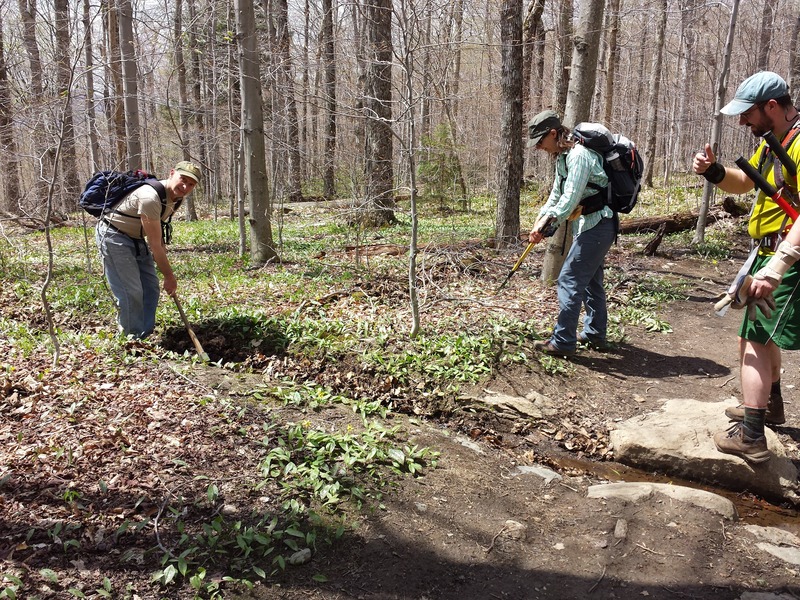 Overall this spring the Burlington Section did 5 trail work hikes, with 52 worker-days! We had high turnouts on the first 3 outings, so we also covered the old LT from Rt. 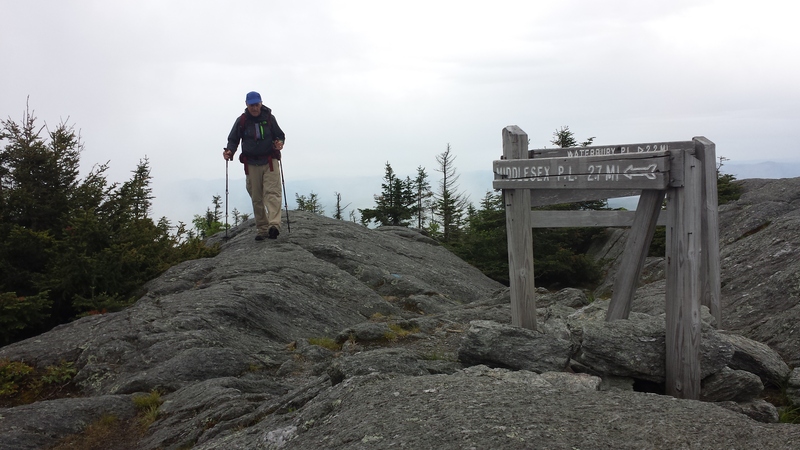 2 to Bolton Notch Road and Frost and Rock Garden Trails, as well as the LT from Rt. 2 to Butler Lodge, Nebraska Notch Trail, Butler Lodge Trail, and Lake Mansfield Trail. We cut about an average number of trees. There was less clipping than usual, but plenty of waterbar cleaning. We had good weather all days, though a little too hot. 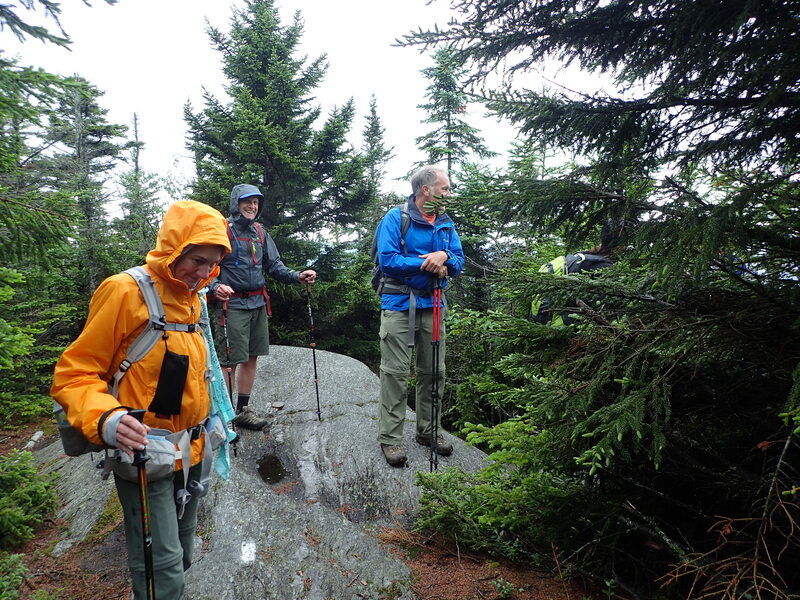 Our outings were on Saturdays and most of the Sundays were rainy! Many thanks to our new volunteers and our regular volunteers! 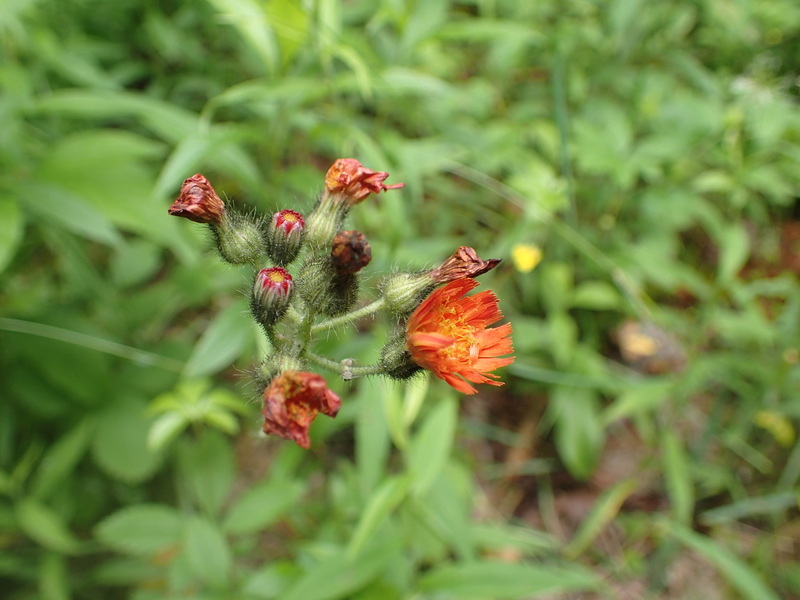 After a rainy and thundering night on Friday, there was some concern the weather would continue to be nasty for Monday’s hike; however, with only a few sprinkles early in the morning the day turned out to be perfect hiking weather albeit some bugs were out in force. 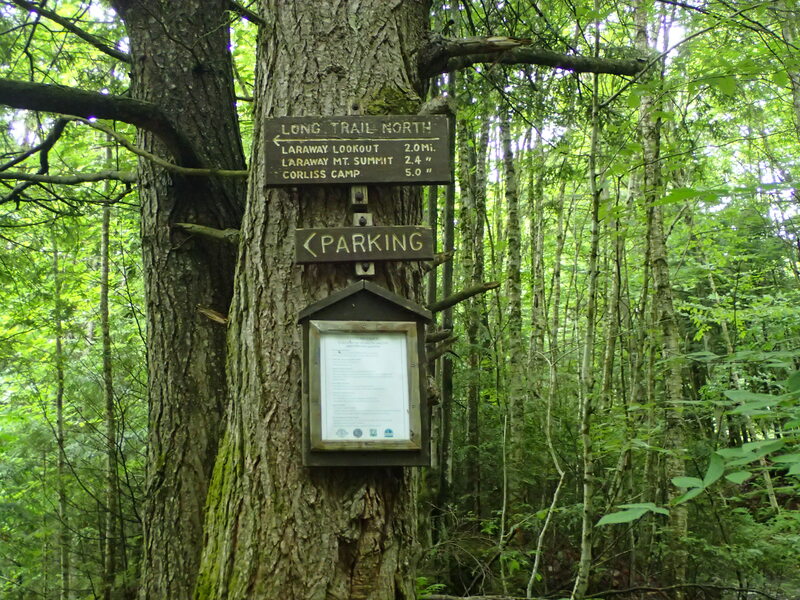 The group of three started at the trailhead around 9:00, took the cutoff from the Burrows trail to the Forest City Trail to join the Long Trail to the summit. Only a few other hikers were on this part of the trail. 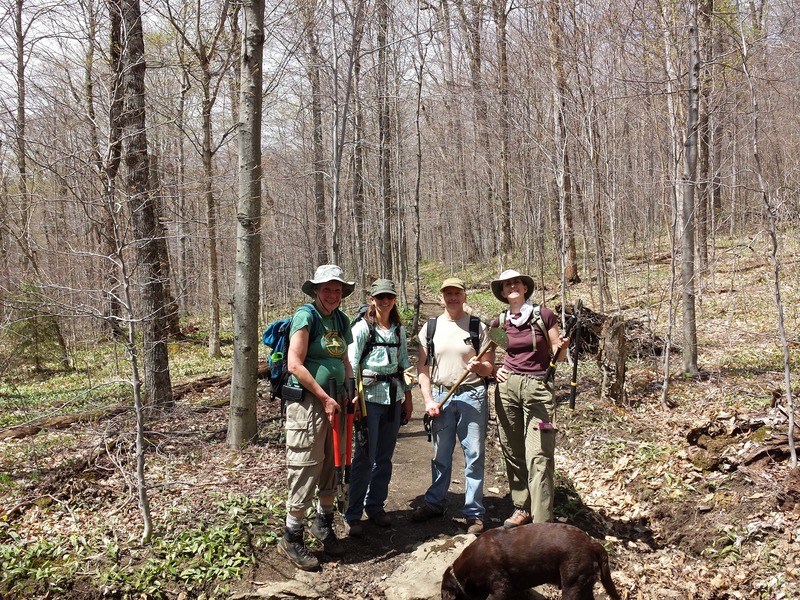 After lunch, we descended via the Burrows Trail and met many more hikers, as usual. The weather continued to improve with sunshine when we finished at 2:00. 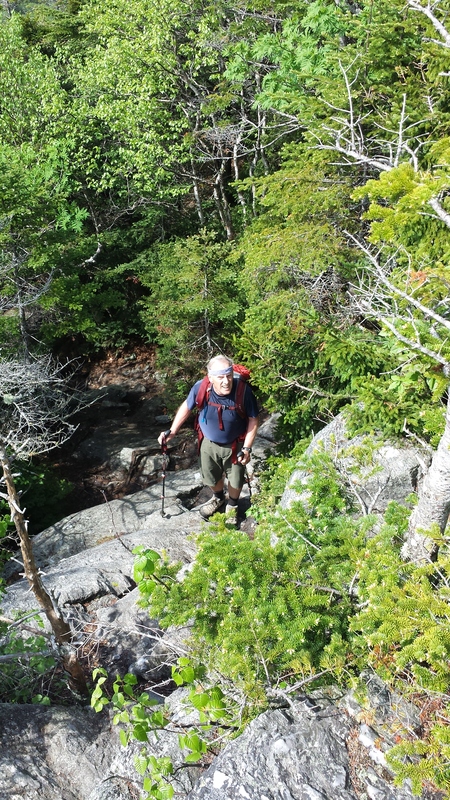 Mike Byerly, a peak bagger from Londonderry, NH who wanted the Hump to his long list of New England summits, joined David Hathaway and myself on this enjoyable hike after a month of letting the trails dry out. The trails were in good shape. 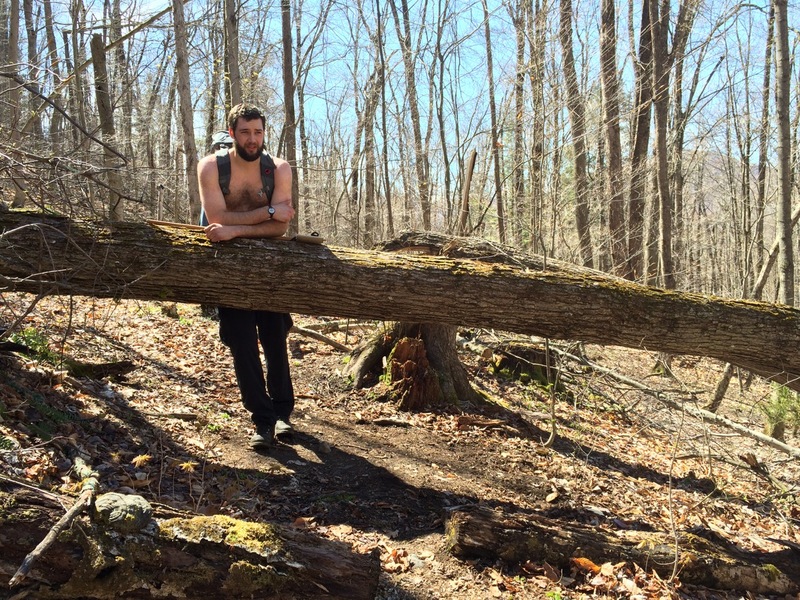 In hiking, Max Seaton (trip leader). From South Hero, eight bikers did went. Rain predicted at forty percent. And the good news is no one got wet. 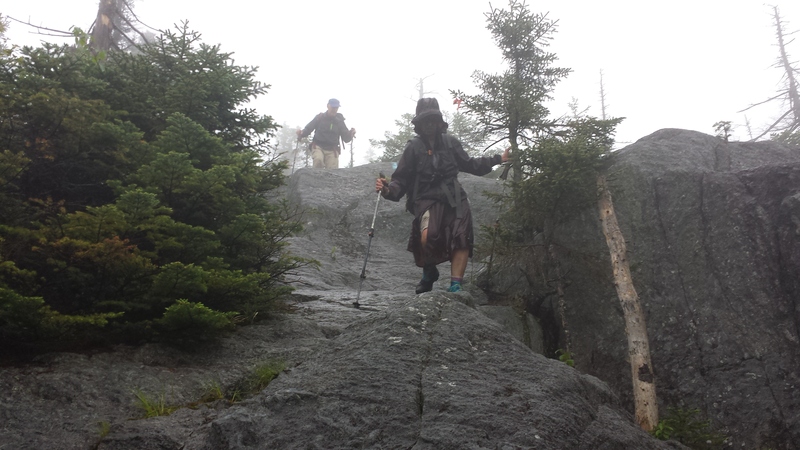 Trip leader (and poet): Mary Lou Recor. 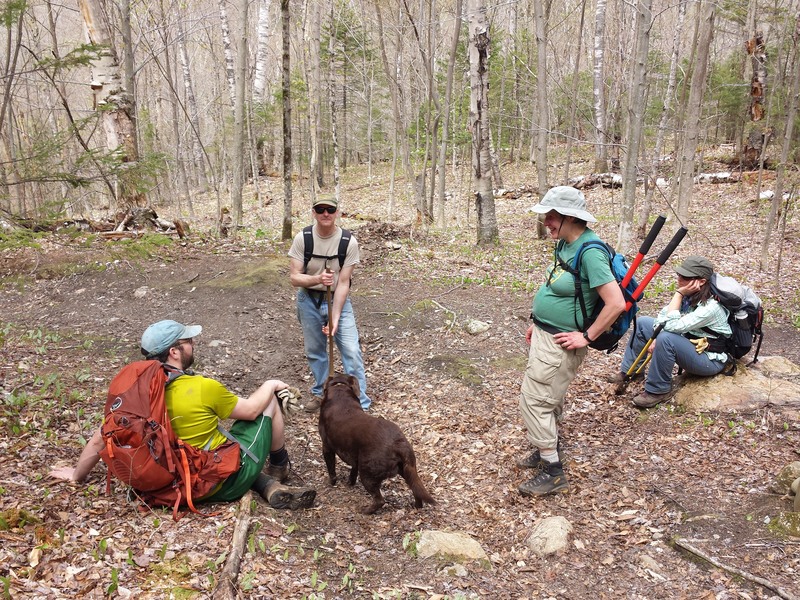 For our third section trail work outing, we covered Lake Mansfield Trail and the Long Trail from Taylor Lodge to Puffer Lodge. John Sharp and Phil Hazen started early from the Nebraska Notch parking area and took a chain saw and clippers all the way to Puffer. The rest of the group (11 folks!) meet at the Richmond park and Ride, carpooled to The Trout Club and then divided into groups to more efficiently cover the trails. one group hiked the longest and then started clipping, another group hiked to Taylor and then starting clipping and using the Hazel hoe, another group clipped and used a Hazel hoe on the Lake Mansfield Trail, and the last group clipped and checked out the trail between the two parking areas, one at Lake Mansfield and the Trout Club, the other just before the Trout Club entrance (for use by overnight hikers and winter hikers). 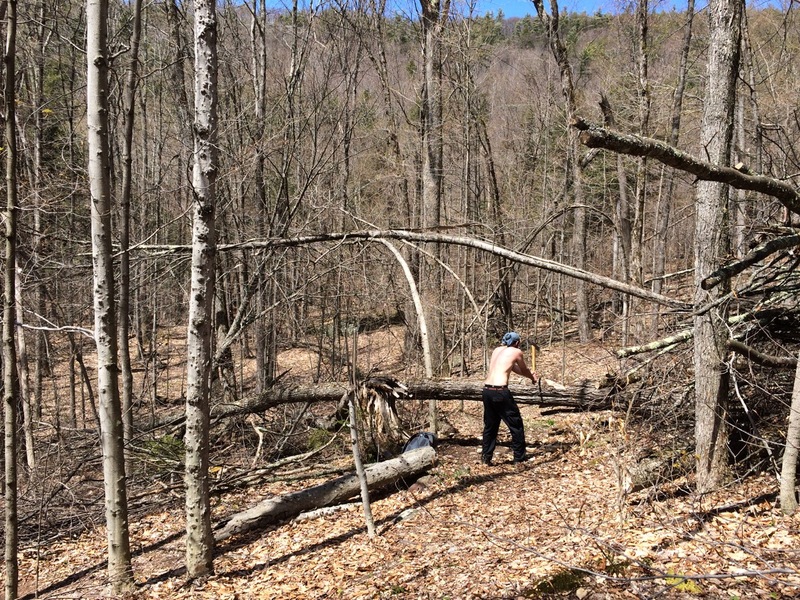 We also took a chain saw up Lake Mansfield Trail, but it wasn’t needed. 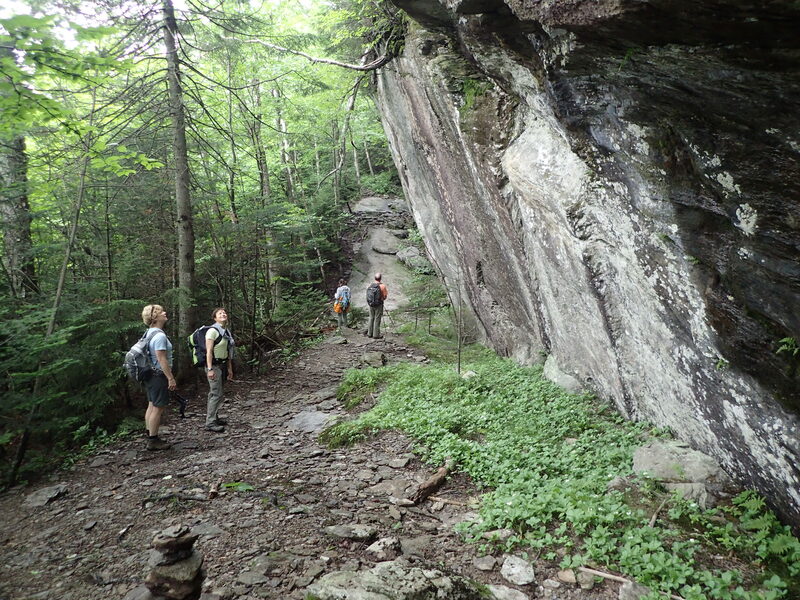 All groups kept going up the trails until we met and turned around, giving the trails a very good clipping. There was only a modest amount of work to be done on the trail. The final group did discover a very unsafe bridge between the parking lots, which has been reported to the main club. For our second Section trail work outing, we again had 15 people! We divided into 4 groups. 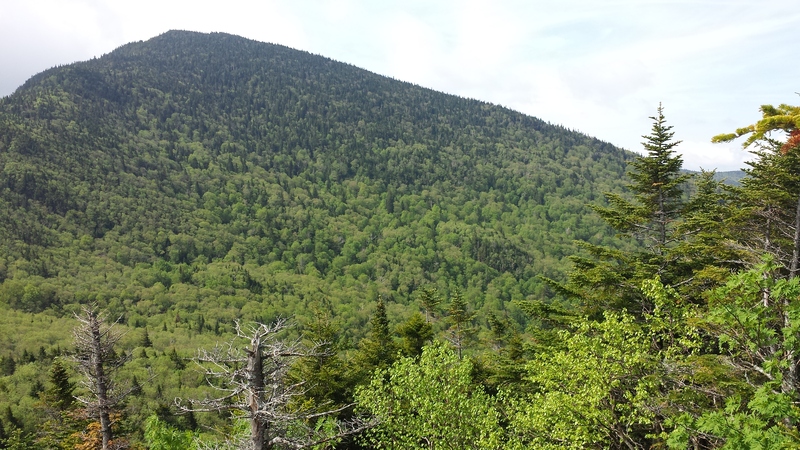 John and George Long went to cut the trees missed on the old LT from Bolton Notch Rd south. They got some, but then the new saw wouldn’t work right. the rest of the group went to the Stevensville trail head. 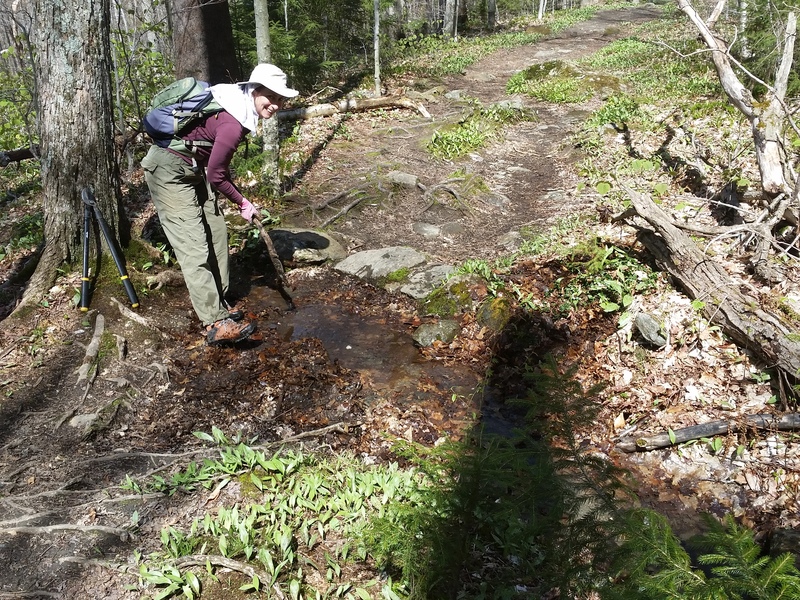 Pam lead a group of 5 up Nebraska Notch Trail, clearing waterbars and clipping and continued to Taylor Lodge, also doing the Clara Bow Trail. 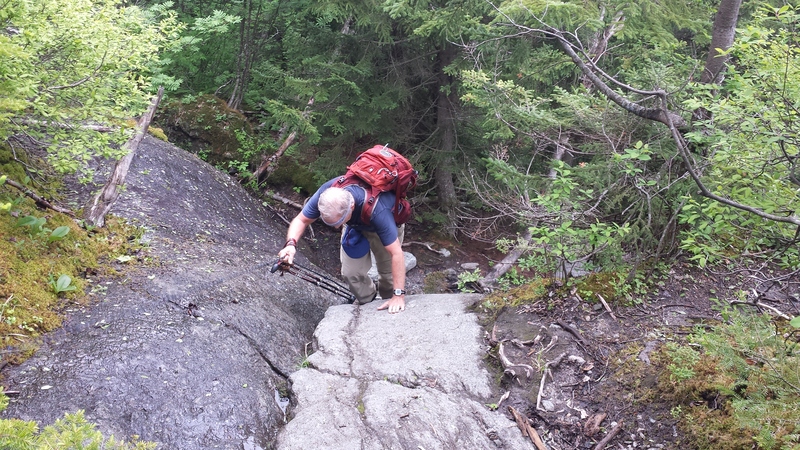 Jeffery lead a group of 4 up the Frost Trail, Maple Ridge, Rock Garden clearing waterbars and clipping. 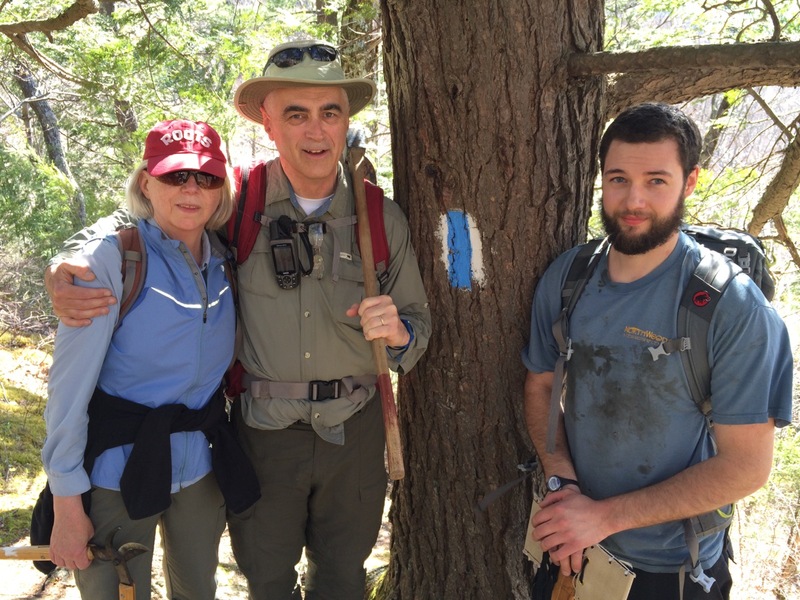 Ted Albers lead the last group of 4 with a chain saw up Butler Lodge Trail and then on the LT to the Nebraska Notch Trail. There was a very large blow down south of Butler Lodge totally blocking the trail. Ted cut it. a warm day and lots of work accomplished! 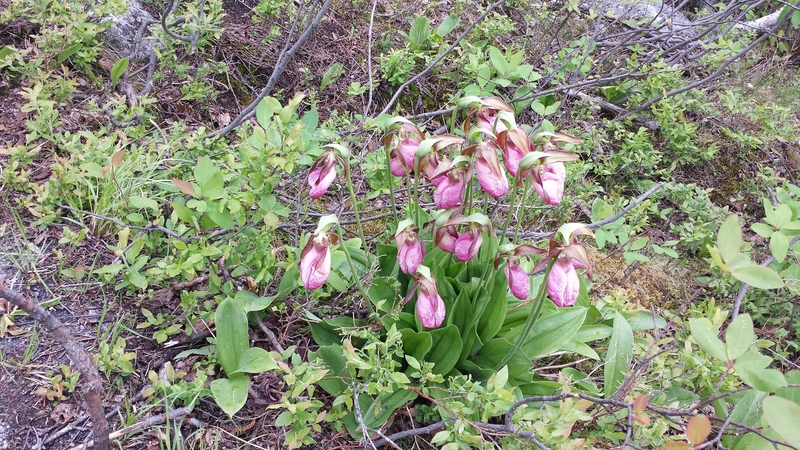 The pictures are on the Nebraska Notch Trail. This year Mother’s Day started out cold and raining but dried up by the 4 PM start time and the sun came out in advance of this event. 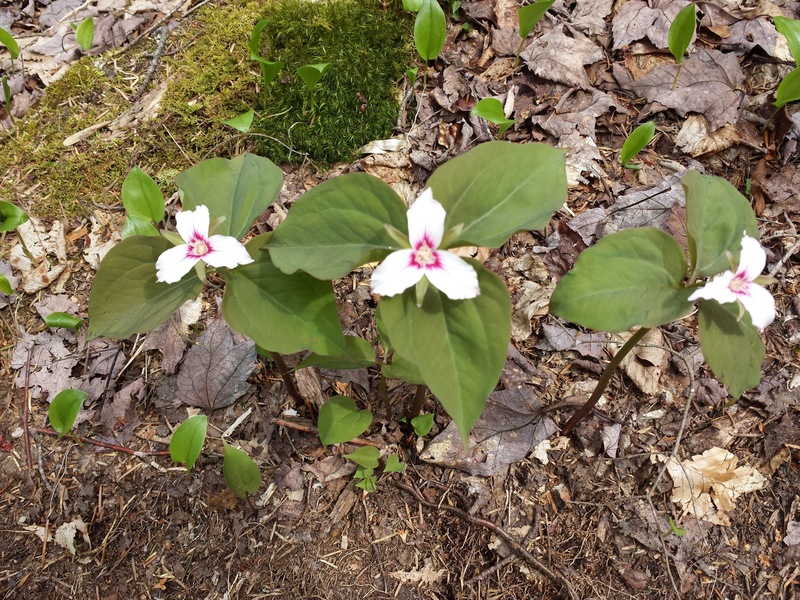 Two of us and one happy dog enjoyed this beautiful walk with views of crystal clear water, blue skies and plenty of trillium. We checked out the rope swing and discussed making plans for returning when the water warms up. Thanks to all of the past trail work there were only a few muddy areas we had to navigate. In case anyone wants to kayak in the near future know that the boat “dock” is a state of shambles at this time. All in all a great walk that I wish more had attended. Nancy Hankey (leader), Denise Monette, and Crystal. 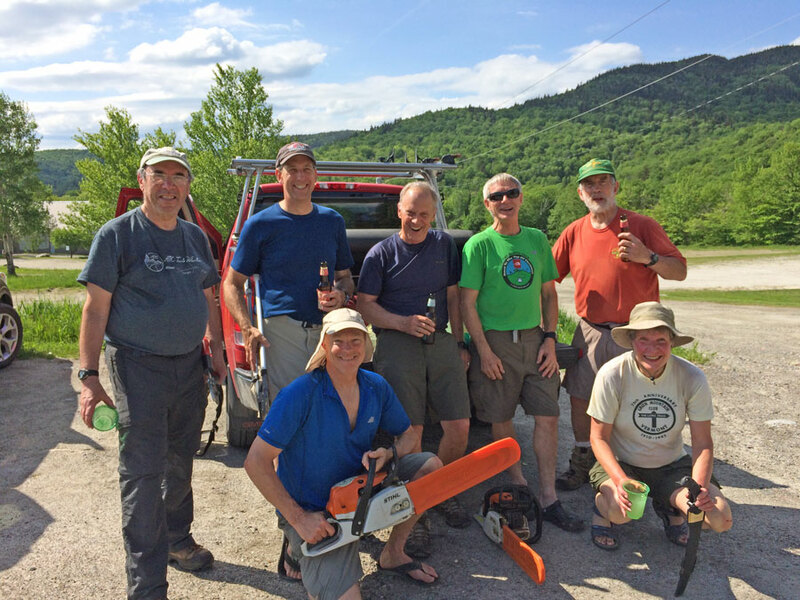 A work crew of 15 assembled and split into four teams, led by Pam, John, Ted, and Jeffrey. 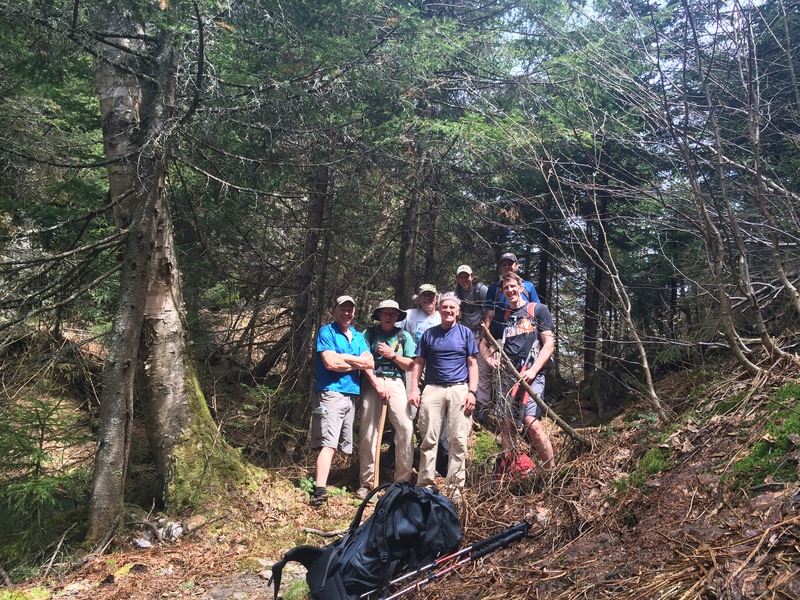 John Sharp took a group of 4 and the old club chainsaw and headed from Bolton Notch Road north to Buchanan Shelter. They cleared several blown downs. When they headed down from the LT to Buchanan, there were 3 more trees, but the old saw stopped working; it kept cutting out. We will have to see if it can be repaired and return for those trees. Pam lead a group of 4 from the new parking area on Rt. 2 up the new Long Trail. There were several trees to cut and the new saw worked beautifully. They turned around when they got to the point the adopter (Scott Alberson, who was with us) had cleared to. It turned out to be a warm day, plenty of sunshine. Ted took a group of 4 on the old blue-blazed LT from Stage Rd. 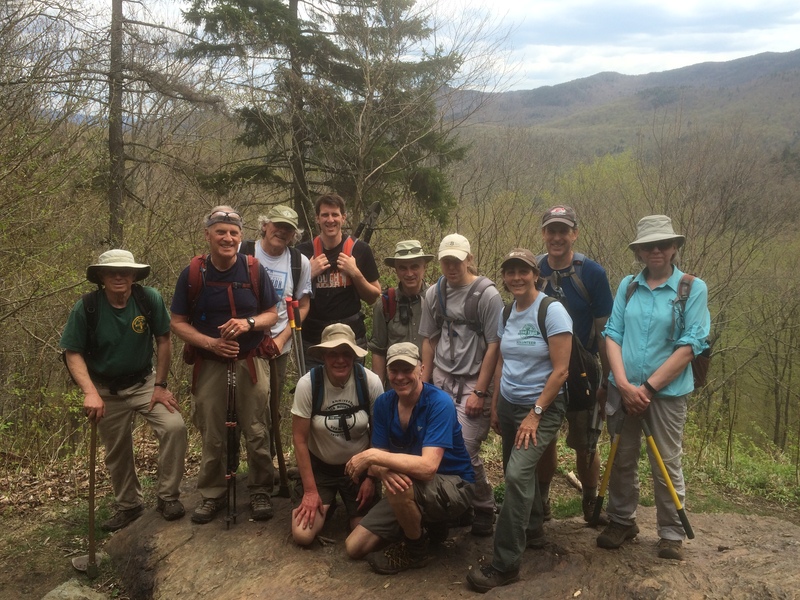 / Jonesville north past Duck Brook shelter and up to the beaver pond where they were met the remaining group of 3 led by Jeffrey heading south from the Notch Road where the old LT crosses. They didn’t have a chainsaw, but did have Tucker’s mighty axe. Along the way Tucker cleared about 4 or 5 blowdowns that normally would have been quick chain-saw projects. Still heading north, they then came across this monster at chest-height which they took note of and continued up to the meeting point at the beaver pond. This blow down is about 1/2 mile north of Duck Brook. On the way home headed south with all the major work done on our section, Tucker sped back to this blowdown and started chopping. He was a good sport and stopped when it was time to leave, but could have easily spent another 15 mins at it and would have cut a passage through. If he had done this (and maybe we should have let him?) then there would be no need for any more chain-saw work from the Beaver pond south. So other than the trees still to be cut, the old and new LT from Rt. 2 to Buchanan is done.